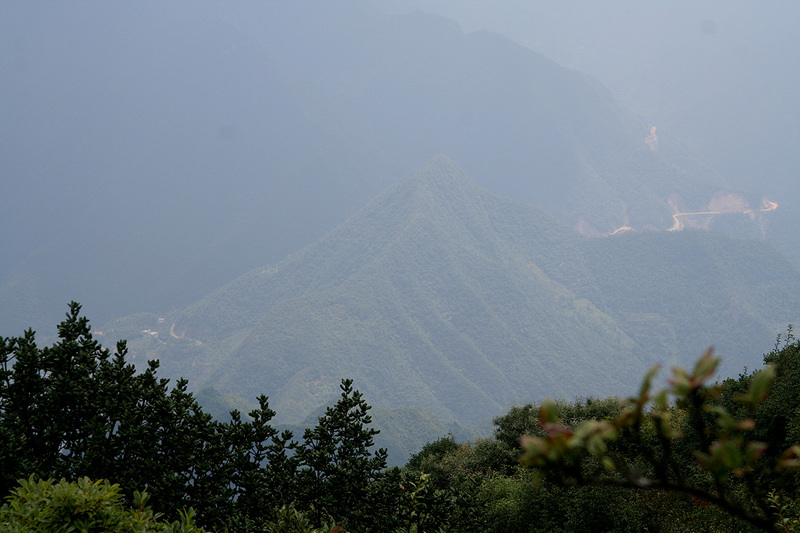 Note: The mountain is called Bai Yi Zhai, the highest summit is named He Feng Jian. 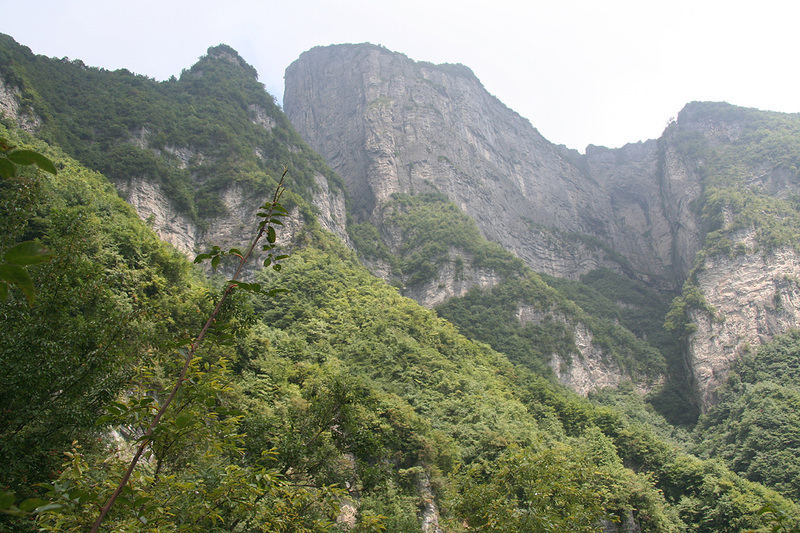 A natural point of reference may be the city of Zhangjiajie, served by major airlines as well as being the location of the famous Hunan, Zhangjiajie National Forest Park. 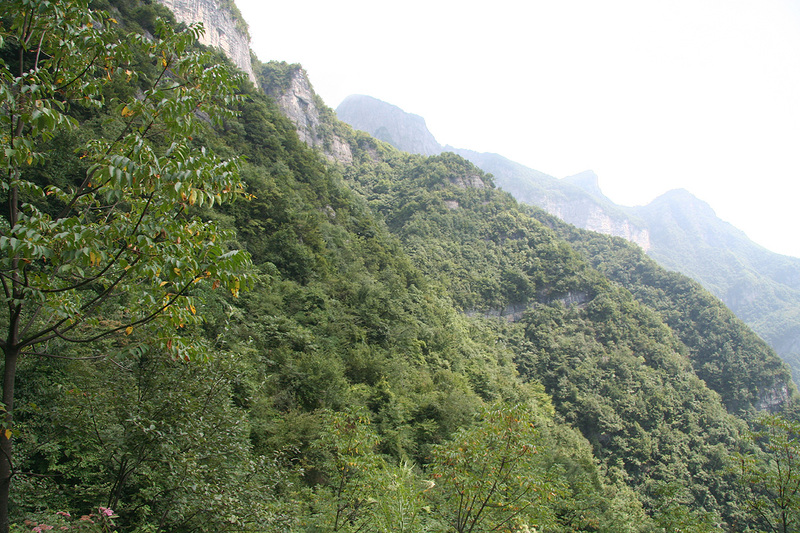 See my climb of Tianzi for more details. The following description refers to the Google Map provided at the end of this page. Locate the airport (Blue marker 48) south on the map. 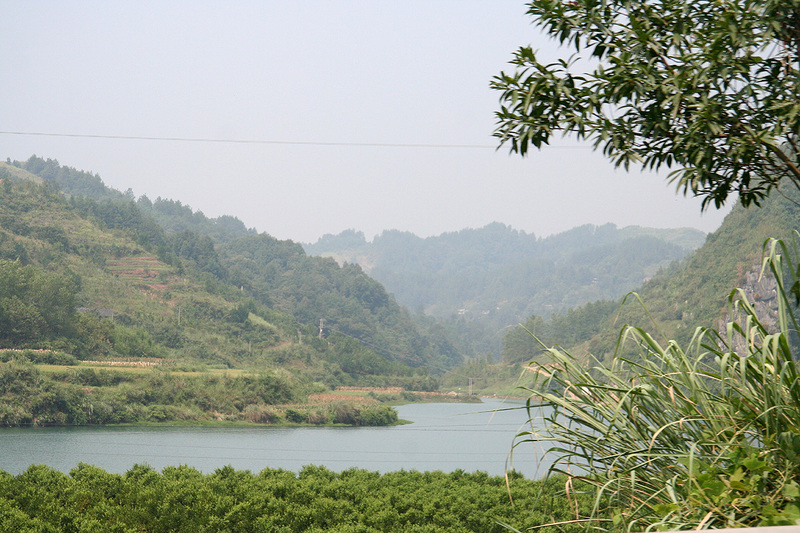 In order to travel north to the village of Wufeng (blue marker 38), one must either go west or east of the National Forest Park that is located immediately to the north. Going east may be preferable, but I have no experience with this route. Following my route, (going west) the drive can be done in 8 hours including a good break for having lunch. This route would proceed to follow the markers 48, 47, 46, 45 going east, then forking more north while picking up the markers 44, 43, 42, 41, 40, 39 and 38. I travelled along this route in the opposite direction. By clicking on these markers you will find the time of my visits, thus providing a more accurate picture of the travel time involved between these waypoints. From Wufeng (please again refer to the Google Map), travel north and locate the road fork at waypoint 37 (location N30:13.223, E110:38.536, elevation about 545 m). Note that the waypoints and the map are misaligned (September 2009), the waypoint was taken at the correct road fork where a smaller road forks right. Drive this road as it descends slightly and crosses the river on a small bridge. Immediately, on the other side in a sharp right curve, a small dirt road heads uphill to your left. This is a possible trailhead, marker 35. The location is N30:13.094, E110:37.935, elevation about 515 meter. There is an alternative, possibly more convenient trailhead. Proceed along further along the road and locate waypoint 36 (green marker). This location should be N30:14.537, E110:37.620, elevation about 545 meter. At this point, a small dirt road heads uphill. If (very likely) this road continues to climb the hillside in zig-zag turns, then one may drive up here, all the way to waypoint 34, location N30:13.679, E110:36.623 and elevation 1160 meter. Ask the local farm about where and how to park in order to not cause any inconveniences. This option would reduce the vertical ascent by more than 600 meter. If you start from the first trailhead described above, then proceed up the small dirt road and follow it until it connects with a trail that heads steeply uphill. This trail first climbs then sort of traverses (with a few ups and downs) around the local valley passing by some farm houses in the process. You will walk in an arc until you connect with an uphill trail at the opposite side of the valley (relative to where you initially ascended). This trail runs uphill and tops out at the end of the ridge that has a small dirt road coming up from the opposite side. Follow this road along the ridge top and then slightly right to a couple of farms. This location is at N30:13.679, E110:36.623, elevation approximately 1160 meter. Just before the final short hill connecting up to the upper building, a trail leaves the road on your right side. This is the correct trail to take. Alternatively, one may be able to drive from the second trailhead described above. In this case, you only need to locate the trail that leaves the road on its right hand side at location N30:13.679, E110:36.623. Proceed along this trail as it takes you higher. The trail will often pass through farmed land, be careful not to destroy any crop. Higher up, you will walk right in front of a farm at location N30:13.732, E110:36.192, elevation about 1446 meter. Turn around the corner (right) of the last building at or near this location, your trail continues uphill here. You will pass another farm house even higher up, then traverse a bit to your (uphill facing) right and reach another developed area where your trail turns left (in general, the uphill option is the correct choice). The trail now heads steady uphill in order to reach the highest farm pasture, a few cows may be around a somewhat old building. This location is N30:13.879, E110:35.524, at elevation 1813 meter. The corrrect trail now ascends the grass slope just behind this house, this trail is more distinct as you gain elevation and heads up and into the forest higher up. Proceeding higher, you again move left (when facing uphill) of the main ridge, traverse a bit in the steep slope, then zig-zag uphill to reach a somewhat open area between the main peak, He Feng Jian (left), and a lower subsidiary peak on your right. The trail is now more faint, but one should try to follow it as it heads mainly to the left and gains the small summit plateau. 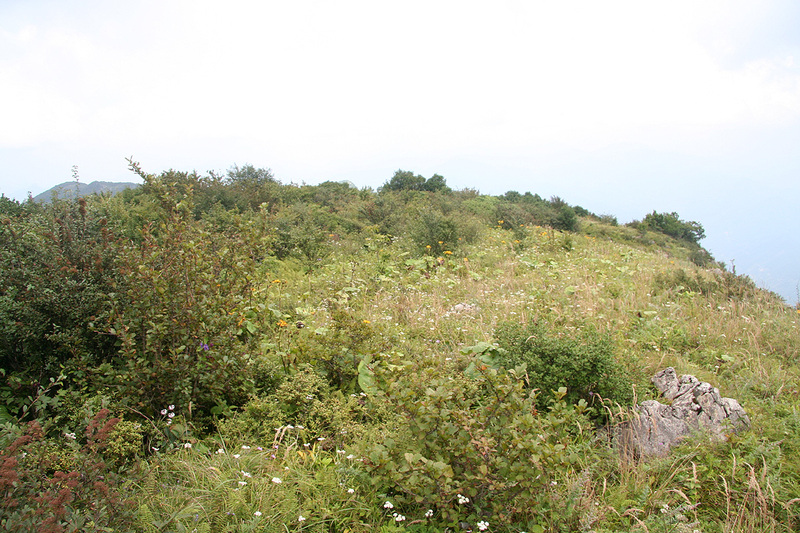 There is no cairn or summit marker, but a few natural rocks are close to the highest point. 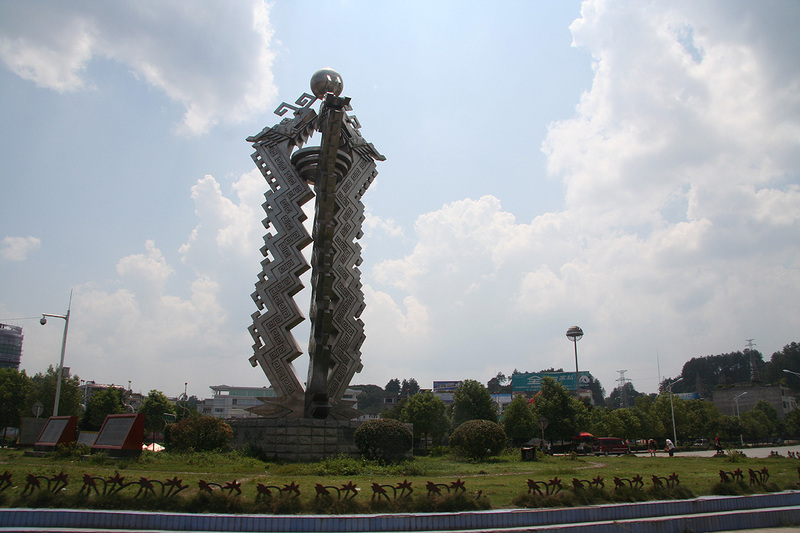 I had arranged this trip by email with the local tour organizer associated with our conference hotel, I had basically provided the coordinates of the summit and indicated that a nearby town appearently had the name Wufeng. I received a confirmation that this trip would be a 3 day excursion, travel on Friday and Sunday, then hiking on Saturday. The cost would be 5000 (local currency), that is approximately Euro 500. The lions share was a car including a driver for the 3 days. Added onto this was a (tourist) guide at 600, two nights in a hotel for 800, a local (farmer) guide, various service fees etc. 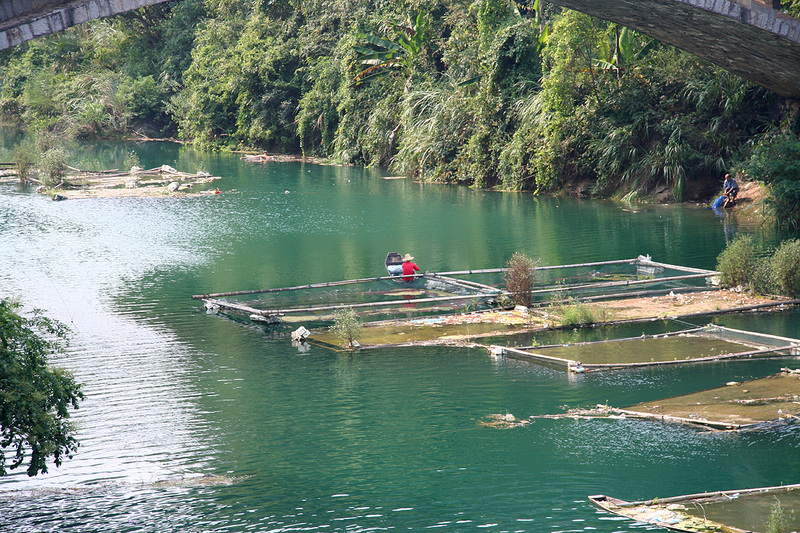 From Zhangjiajie to Wufeng: We left at 0930 and drove back to the city of Zhangjiajie, then headed north-east. 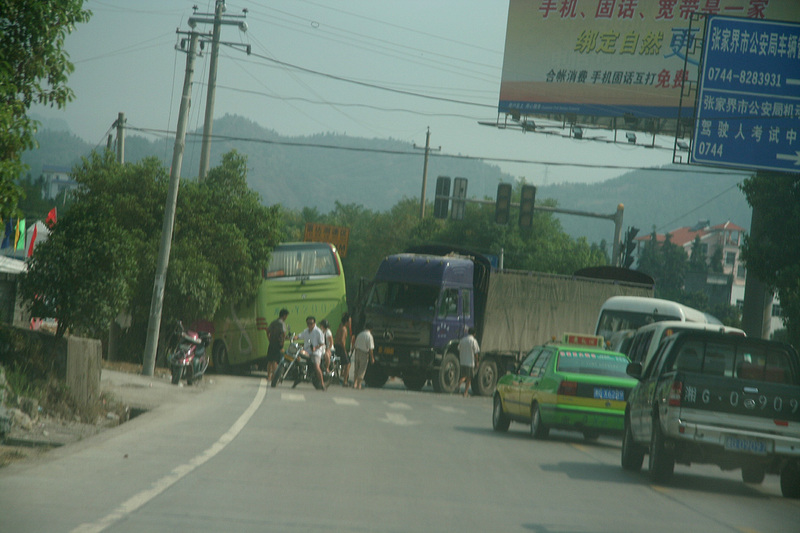 Before travelling very long, we came upon a traffic accident where a bus had collided with a truck, fortunately, it seemed that there were few injuries. 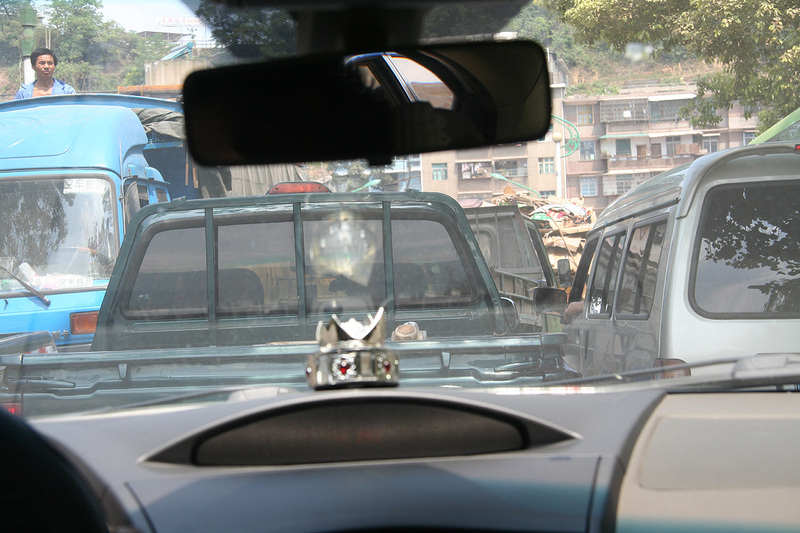 Traffic is a bit wild, the most important feature being active and continuous use of the horn. Pedestrians need to look out, they seem to be considered "fair game". Our route can be checked out by clicking on the Google Map provided at the end of this report. By clicking at the markers the time when reaching each waypoint is displayed. 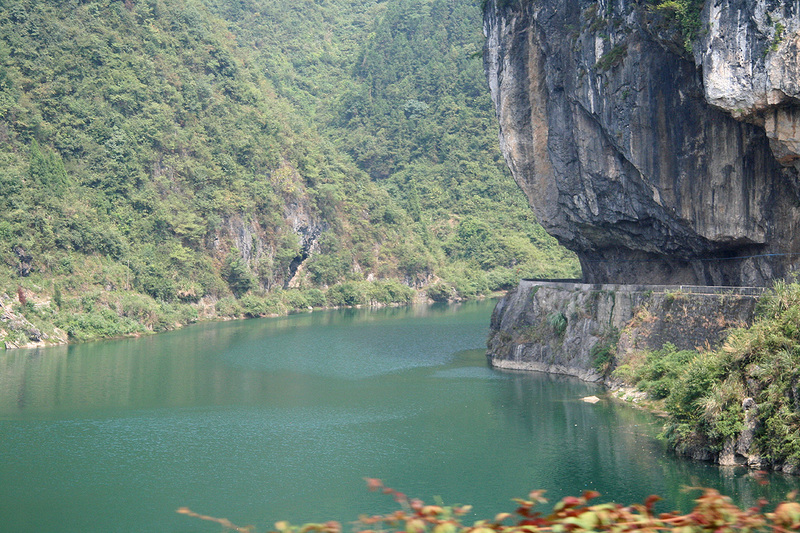 The road was quite scenic, making its way up valleys and along deep green lakes. After driving for quite some time, we stopped in a city and had lunch. When we continued, I expected us to gradually get closer to our destination. We had started out with a GPS distance (straight line) of 98 kilometer, by now this distance had increased to about 130 kilometer. As we continued north, it did not seem that the distance decreased much below 100 kilometer. I got increasingly worried about this lack of progress and told the guide that we needed to go more east, in fact, that we still needed to move about 100 kilometer east. His first reaction to this was to make the driver make a right turn at the first possible intersection. This did not look like any connecting highway at all, I pointed out that one could not just make a right turn, but would need to know that the road indeed would lead to our destination. This did not seem to be appreciated, I strongly asked that they stop and buy a map in order for us (in particular me!) to understand where we were going. They finally agreed and ran around in a city for quite a while before returning with a road map that covered the entire China. The scale was such that I immediately decided it was useless. 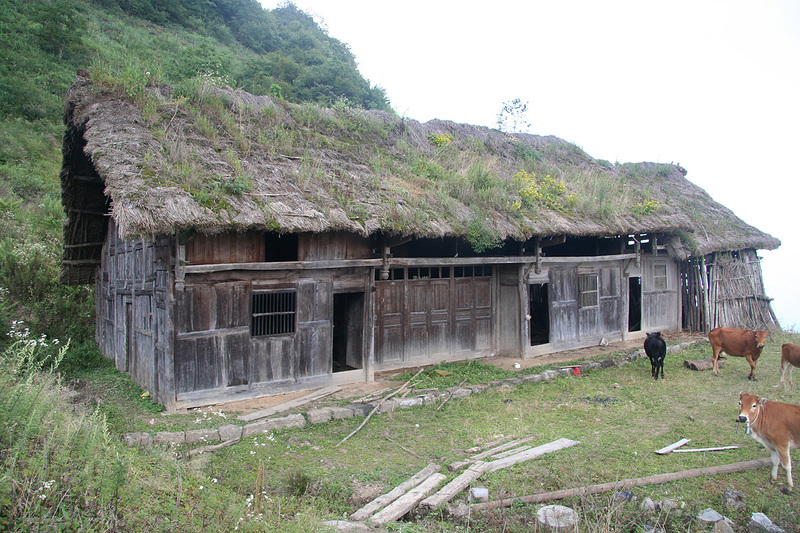 The guide also admitted that the village of Wufeng was not even shown on the map. We drove on and got into a new, rather large town. New hunt for map. This time they returned with essentially a city map. It was clear (to me) that this map was just as useless as the previous one. It was also obvious that they did not know what to do, basically lost in the middle of China. I called the excursion organizer at the hotel and explained to him in pretty direct language that we now had travelled about 8 hours, that we were 100 kilometer west of the destination and that I only saw two options: 1) get me to the agreed village without any further delays, or 2) we would return to the hotel and I would ask the 5000 back. The prospect of option 2) clearly scared him, more phone calls followed with my Chinese company. 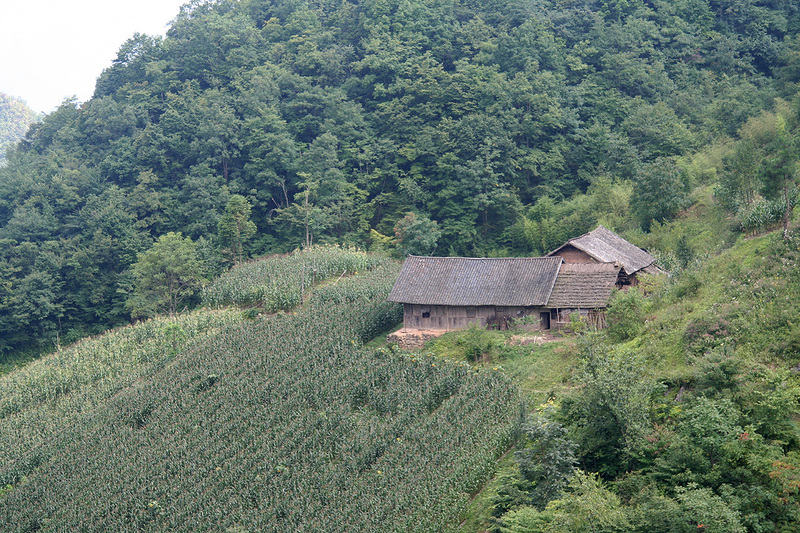 It seemed like they had tried to drive me to Wufengshan (shan means mountain), but this mountain was nowhere near my village called Wufeng. 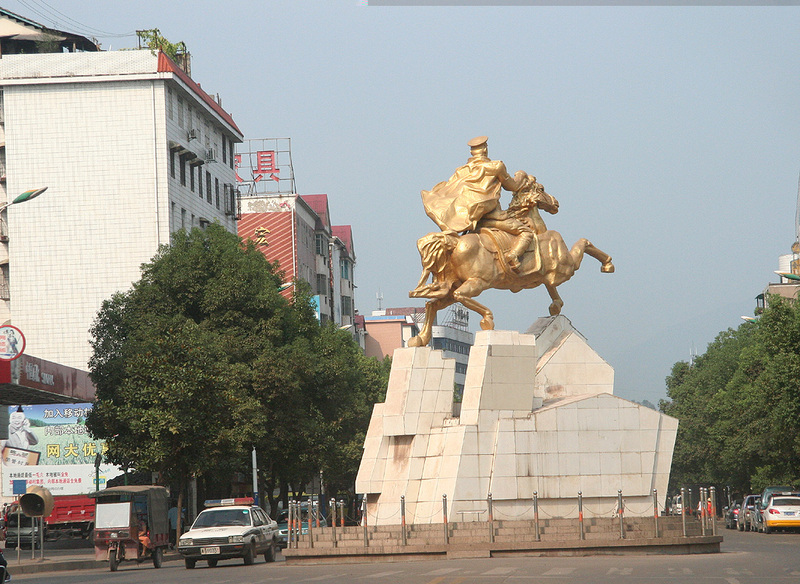 I cannot see any excuse, especially since I showed a possible route from our hotel to Wufeng as suggested by Google Maps to the hotel organizer the day before my departure. 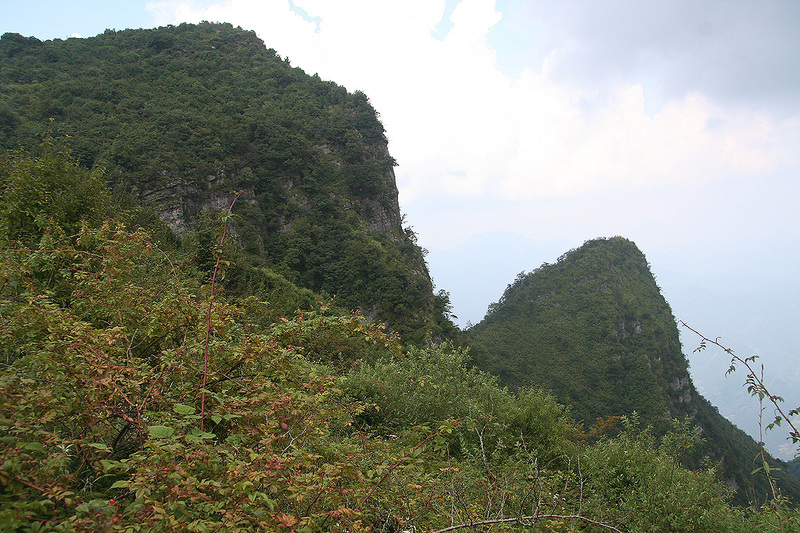 It seems like they had just ignored the critical information of where I wanted to go and just "decided" that the peak I should climb was Wufengshan. We then drove back the same road as we had been coming. It was dark when the emergency flash of another car made us stop. It turned out that they had organized a local driver who knew the area and agreed that he should join us. My driver moved over to the other front seat and our new driver took control. Finally, we started moving in a more promising direction. They informed me that we would need at least 6 more hours of driving. I realized that this would be a very tough trip. My knees and legs were already quite uncomfortable from sitting in the back seat with limited room. 6 more hours? It was true, by 0140 we arrived in Wufeng and to my great surprise, there were a few people out on the street with a wok and seemingly serving food. We stopped (the travel had lasted 16 hours) and actually had a pretty good night meal consisting of Chinese dumplings. 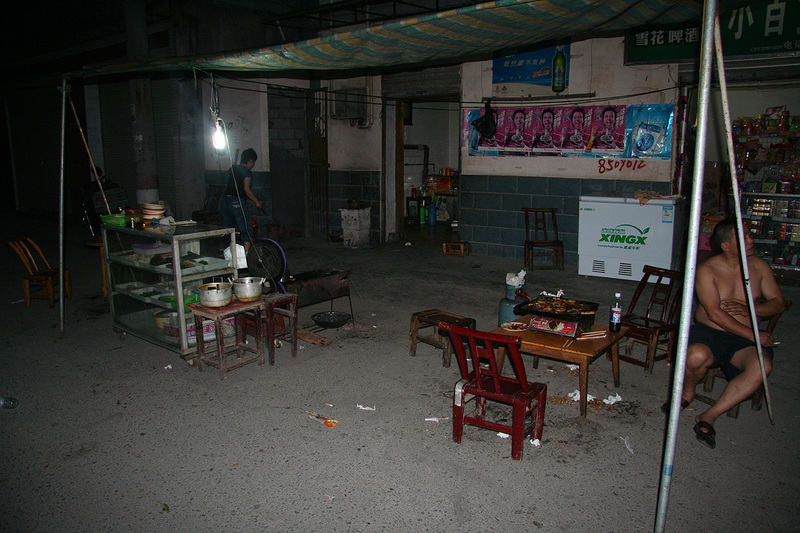 The setting was unique, here I was sitting in the middle of the night, having an outdoor meal of Chinese dumplings together with a bunch of local people. I actually enjoyed this stop quite a bit, an experience that will not be forgotten. What remained, was to find a suitable trailhead. We set off again and I soon discovered that the mountain was getting farther and farther away. Again, it seemed that my friends had decided which mountain I was going to. Again, it took some pretty direct talk to convince them that I already knew which mountain I wanted climb and no other. 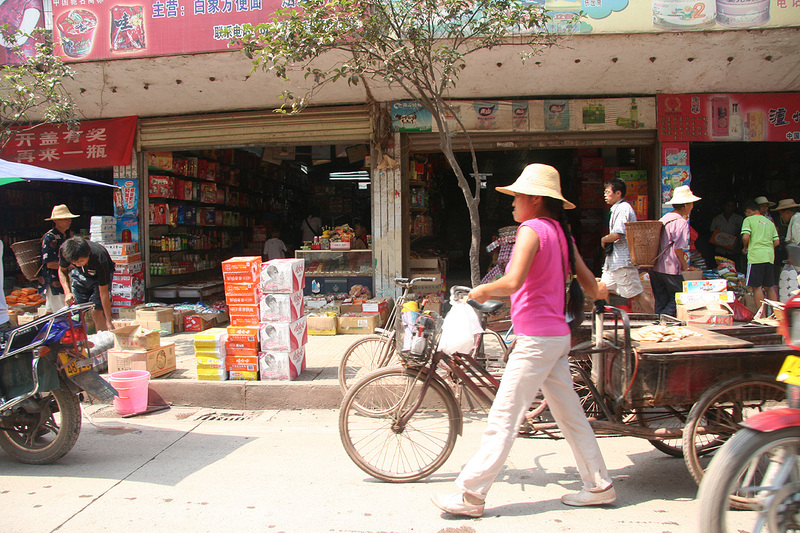 We returned to Wufeng, then started slowly to drive directed by my GPS. We climbed a hill and eventually drove through a tunnel. The direct distance to the peak was less than 5 kilometer and our elevation was slightly higher than 1000 meter. This looked good, I told my friends to stop and said that I would like to attempt the hike from this location. 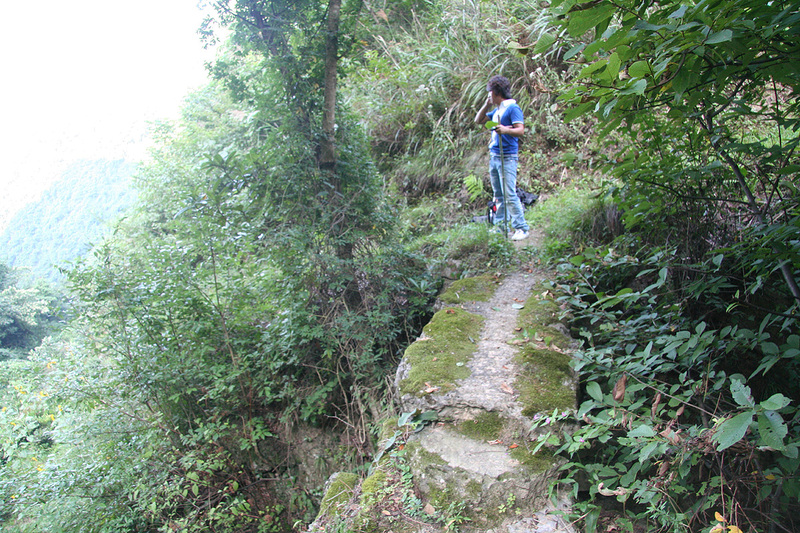 The ascent of He Feng Jian: We had finally arrived at what looked like a possible trailhead. 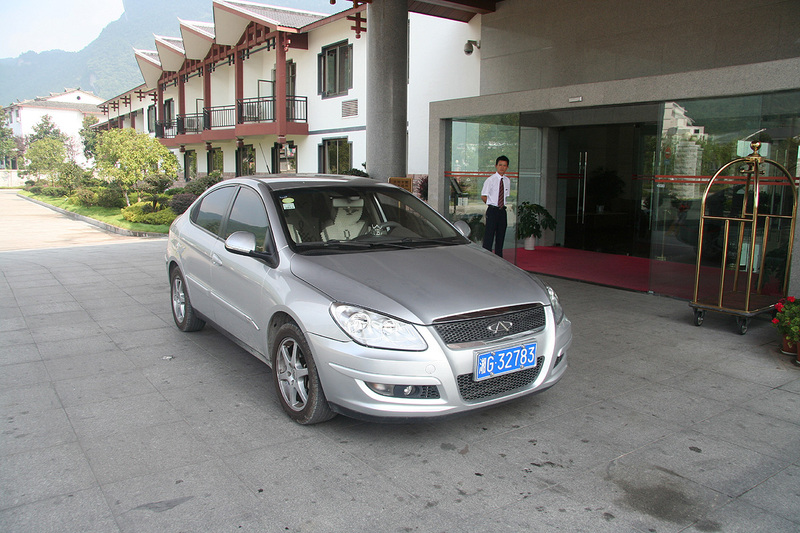 The time was 0520, 20 hours of car travel since leaving the hotel. Daylight would come in about 40 minutes. I have never felt so exhausted before starting a climb. I took my backpack and spare clothes and collapsed on the rocky, but flat area where we had parked, right next to the road. I never slept, but at least could stretch my legs for a few minutes. I got up after 15 minutes and started preparing for my climb. A few locals came to see what we were doing and I asked my tour guide if he could check if one of them would be willing to show me a possible route. 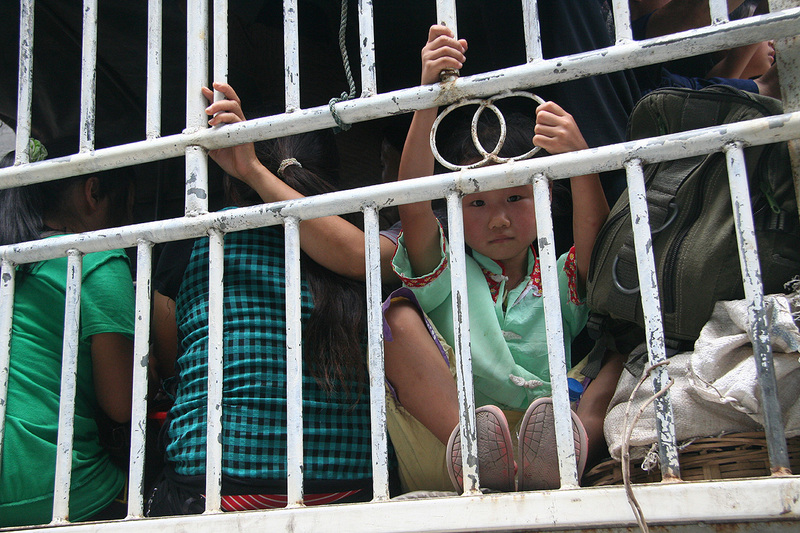 A young man, Wang Ming, stepped forward with a big smile. He looked like he was only a teenager, but turned out to be 23. My tour guide then came across to me and said: "snack on mountain, you go?" I had no idea what he meant and asked if he wanted me to take along some extra food (I had none). Violent shaking of heads. "mountain has snack", hmm, is there some kind of crux that might be really difficult? Finally, he said: "Snack bit you". Of course, now I understood. One could come across snakes on the mountain, snakes with deadly poison. With my rough hiking boots and goretex pants I figured that if Wang Ming could hike in his sneakers then I should be reasonably safe. Thus, Wang and I started out around 0645. I promised to be back before dark, my "tour guide" sounded quite concerned as we left. First, we followed a local road that obviously served a few houses and local mountain farms higher on the slope. After 6-7 minutes this road leveled out and curved around the ridge, then Wang pointed to the highest peak at the horizon and explained (with signs) that this was indeed our goal. Shortly before the road ended, Wang pointed left to a trail and indicated that this was the route. It immediately struck me that any attempt to hike around here without local knowledge would be hopeless. 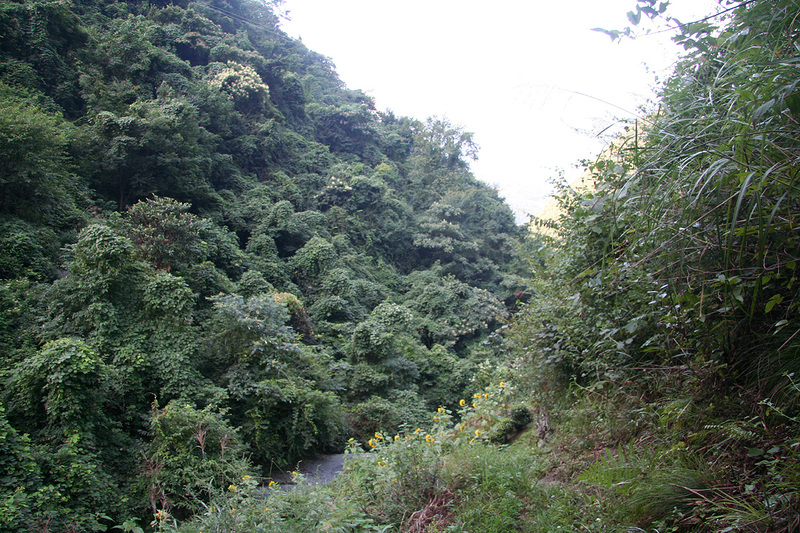 The vegetation was dense and impossible to even consider walking through. Obviously, we would depend on established trails. The trail was indeed very nice and as I could see patches of farmed land, this trail was clearly used in the daily work. We got higher and crossed a rather steep slope with cucumber plants when Wang suddenly stepped outside the trail and made a couple of rotations before being stopped by the tall plants. It turned out that he broke one plant, he was unharmed and laughed as he tried to make the broken plant stay upright again. Soon, we were below the last farm, right next to a very old, nice stone bridge across the creek. The trail forked here and Wang was unsure of which way to go. Quickly, he pulled a Nokia cell phone and rang somebody (in the family) to seek advice. There seemed to be cell phone coverage everywhere, also in the mountains. We crossed the bridge, walked carefully between plants across another patch of farmed land, then the trail ended. This looked pretty bad as I knew that breaking trail through the foilage would be impossible. Wang carefully descended into the creek, the only way uphill would be to walk in the creek, even here the "free space" was often not more than one meter above the rocks. The next 3 hours were spent climbing this creek. Quite incredible, I have never done anything similar before. We gained 500 vertical meter this way, but not without a lot of effort. The climbing was generally short pitches, YDS class 3, however, several waterfalls had to be circumvented by leaving the creek. This always got us into steep, loose gravel with unreliable vegetation. A few trees and roots could be grabbed for holds, but many simply broke. Wang carried a machete and did a great job in cutting vines and brush with thorns. Wang showed me that the best way forward often meant crawling really low near the ground and under the plants that otherwise would block the way. It looked easy for him, not so for me, being considerably bigger (and somewhat older) and also with a backpack that got stuck repeatedly. Crawling meant grabbing for handholds between plants and rocks, my thoughts did return to "snack bit you", it seemed somewhat more of a real danger here. As soon as possible, we always returned to the creek, despite it being steep and slippery with mostly wet rocks, there was more head-room, sometimes one could even stay upright for a few brief moments. This climb was tough also psychologically, we never saw where we were. No way to measure progress. My GPS had totally given up on the satellites above. Every move meant walking with your head and back as low above the ground as possible, I could feel that this would make me very tired quite quickly. After 3 hours, we emerged up to a small patch with lower plants and had sunshine for the first time. We were close to a local col between a lower hilltop on our right and the main mountain somewhere higher to the left. 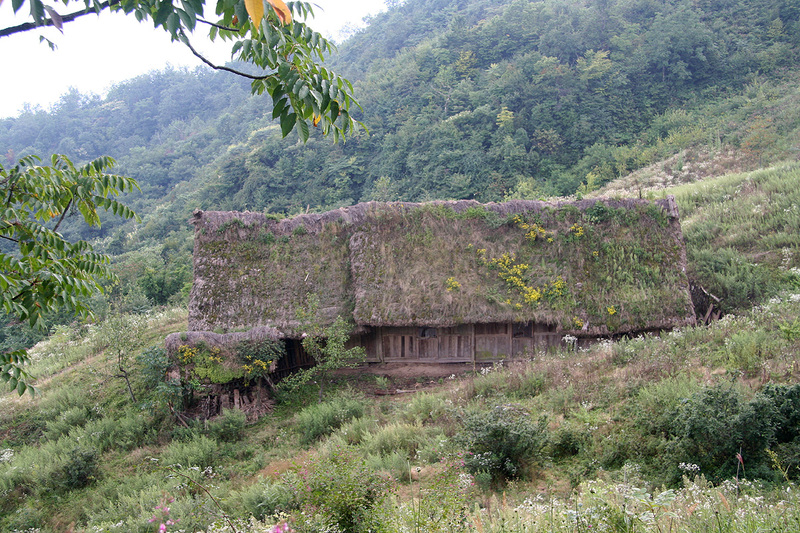 Wang suddenly shouted in excitement, he had come across a faint, but visible trail that traversed on our right side. We followed this and gained the small col. 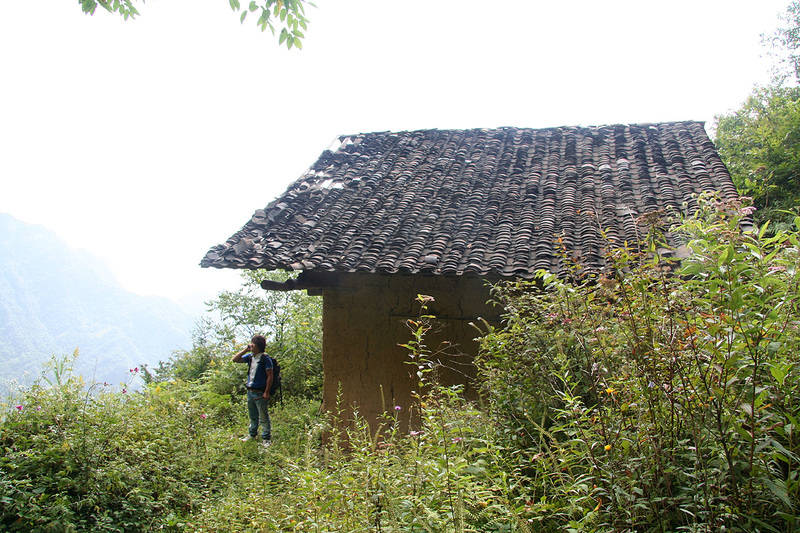 Right next to this col was an old building, this explained the trail, it had been used by whoever set up this hut in such an incredible jungle of vegetation. The trail seemed to descend on the opposite side of the col that we just had reached. From here, I looked ahead to the main peak, still far away. The terrain looked worse than bad, besides completely inpenetrable jungle, now that we did not have the creek anymore, the slopes were steep and numerous really big cliffs added to my sense of calling this project doomed and way beyond any reasonable undertaking. I could hear at least nine voices telling me that I had given it a good try, but that the rest of the day should be allocated to getting safely back down this impossible terrain. However, there was still a tenth, very weak whisper that said, suppose this trail from the hut does not descend to the valley, but rather provides a way to climb the peak? After quite a bit of hesitation, I made sign that we should continue at least a few more meter. Our effort had not been wasted, and miracles do still happen. The trail actually got slightly better and it did not descend, but rather traversed the first slopes, then climbed to a second and higher col. From here, I could see that the trail would make a long traverse right and reach the end of the ridge, in fact from that point the ascent looked possible provided that we could still find a trail. This all seemed to me as unbelievable luck, the kind of thing that simply does not happen when you have been stupid enough to get lost into the deepest and most impossible Chinese mountain jungle. I reached the pastures at the end of the traverse and was greeted by a few cows with babies. Another old farm house that provided shelter (and shade) for the cows, they walked straight into the building when they learned that I did not carry anything that they would want. Many pieces of good news indeed. A big and clear trail headed down towards the valley, this was the way for the cattle to come up here, surely this would be a way for our descent. We would end up on the exact opposite side of the mountain, but that seemed like a small inconvenience compared to downclimbing that creek. 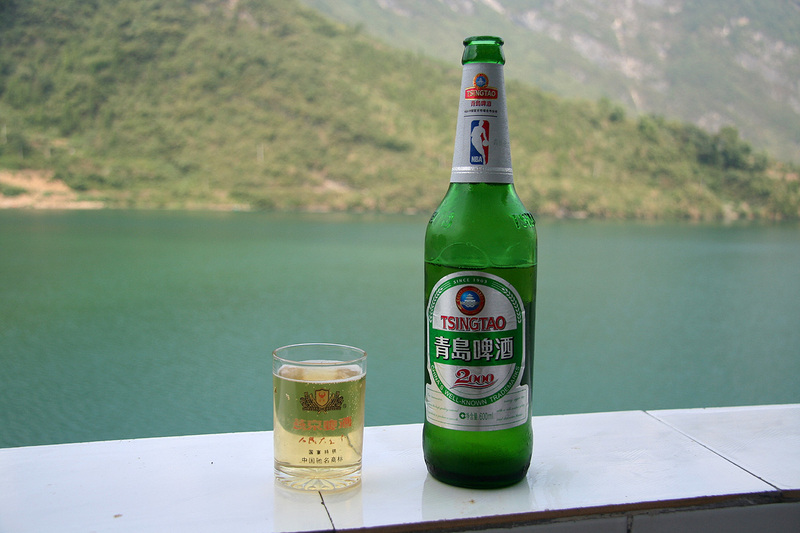 Wang discovered a well with clear drinking water, it was hot and my drinking bottle could now be refilled. I discovered a faint, but clear trail that ascended the ridge, the only feasible route as it looked. Soon, we continued uphill and the trail led us all the way up to a flat area between the three highest summits (only one of these is partly visible in the picture). I first thought that the middle summit, which was most distant, would be the higher one and headed in that direction. We lost the trail and immediately were back to painful fight with thorns and all kinds of hostile plants. Looking back, it seemed that the summit on our left was now clearly higher, so we turned and headed for what looked like the highest point. The going was slow, Wang did his best to cut and clear a path, but it is limited what can be done, it would take all day to really make an unobstructed path. Finally, we were on the top. The time was 1325, it had taken us almost 7 hours one way. 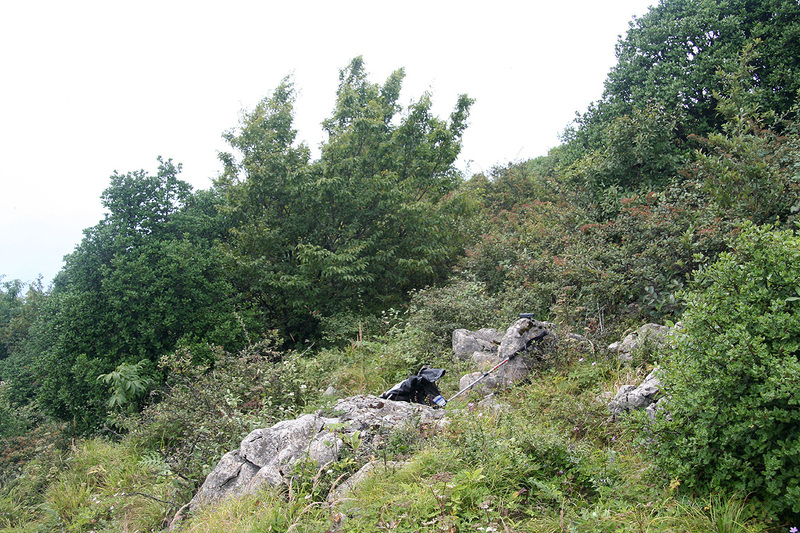 Part of the summit had only low grass, the first open spot I had seen since we started. The highest point was a couple of small rocks, on the far side more vegetation, but it was easy to check that we had lower ground all around. The mountain has a huge vertical cliff facing the valley we had driven up to the tunnel. Wang was clearly enjoying the view, he stood at the very edge and made a good contrast to the haze and clouds beyond. I could see back down to the ridge where the tunnel went through and back to our trailhead. The visibility down to the opposite side was also quite good, it looked like we would have a pretty long descent. Still, given the struggle in the steep creek, I was quite happy to have discovered a (YDS) class 1 route to this summit. I had started from the highest possible saddle, while it now was clear that the correct trailhead is located in the deepest nearby valley. With all the struggle behind me, I was quite happy to have traversed Bai Yi Zhai and climbed its highest peak, He Feng Jien. I called back to my "tour guide" and told him that I now stood at the "highest mountain peak" and that we would descend into a different valley in order to get down before it got dark. I felt really tired, but knew that the rest would still be easy compared to the ascent. I had not had any sleep in the last 32 hours and very little food, but my Chinese project had succeeded despite many problems along the way. We enjoyed the view and the summit until 1350. I made several GPS readings, spaced out in time in order to get as accurate an elevation as possible. I first had two readings at 2323m, then two at 2328m, and finally a shorter read that gave 2326 meter. It seems reasonable to assign (conservatively) the elevation 2323m with a corresponding prominence of 1658 meter. We descended along a trail that certainly can be recommended for any future climb of this mountain. 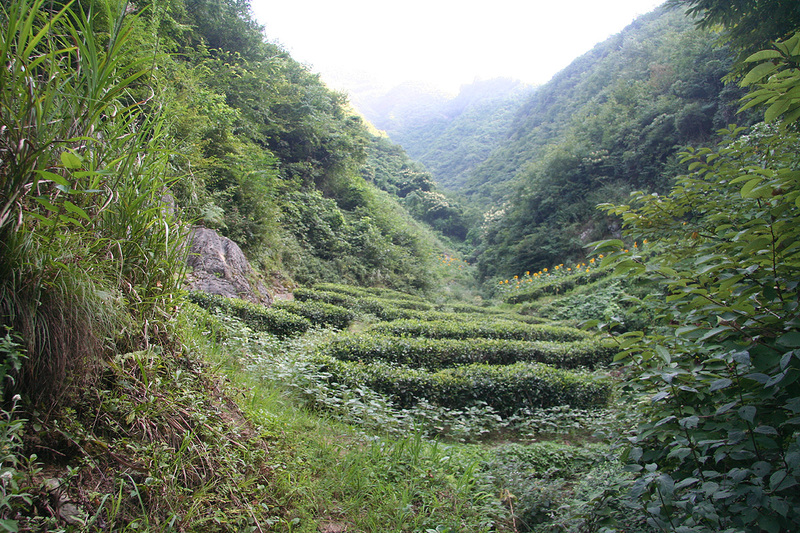 You pass several mountain farms and the trail winds its way through a very nice and partly cultivated landscape. 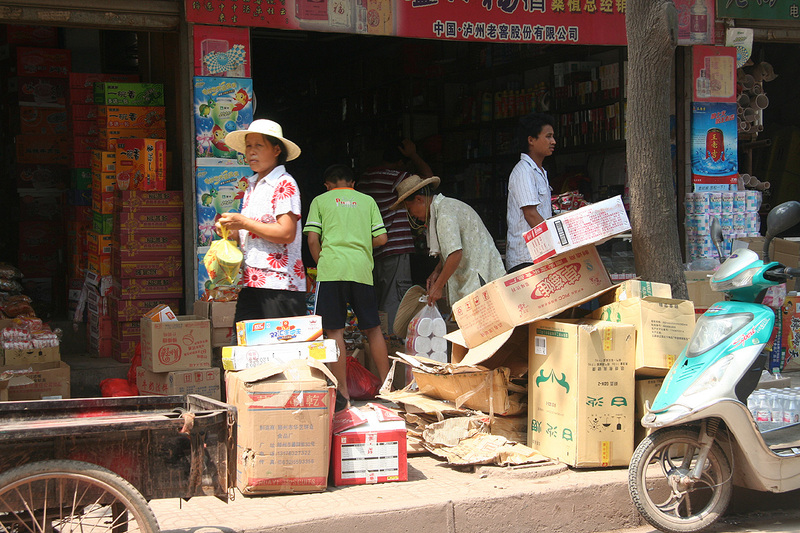 Cucumbers are certainly popular, Wang cut two as we walked by and had me taste one. Anything would taste well at this point, and the cucumber was no exception. Further down, the trail connected with a small road serving two farms near its end. We continued down this road as it ran on top of a small ridge before starting its zig-zag way down to the valley floor on the left side of the ridge as we were facing downhill. 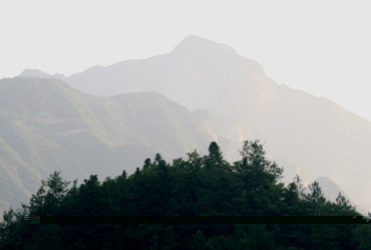 Wang suggested to take a trail that continued more directly down. It seemed like a reasonable thing to do, I assumed that this trail would reconnect with the road a bit further down. However, this was not the case. This trail now continued to contour around the valley we had on our immediate right. It seemed like a long way and every time we crossed a gully coming from above, our trail would ascend to the next ridgeline. It may have been the overall best way, but I was pretty certain that the road would have given us a steady downhill, now we were gaining elevation every so often, just to descend even more. What we probably gained in the end was a shorter hike to the main highway. We hiked back out to the main highway, then flagged down one of these 3-wheel mini-taxis that runs with a rather small engine, but lots of noise. He drove us up the hill, but not without problems. We required 3 stops to fill more cold water on the engine, it seemed to overheat within minutes of driving. At the top, my car was waiting. I thanked Wang Ming for excellent company. He was paid 150 by the guide, then I gave him an extra tip of 100. It seemed that 250 for a day of work was highly appreciated. Most likely, this is what he often would need a month to earn. We drove to a nearby city and stayed the night in a hotel there. Finally, at 2100, we could all eat a good Chinese meal, my first since the dumplings about 19 hours earlier. I slept like a rock and woke up around 0800 on Sunday morning. It was time to travel back to the airport. The return travel went quite smoothly. 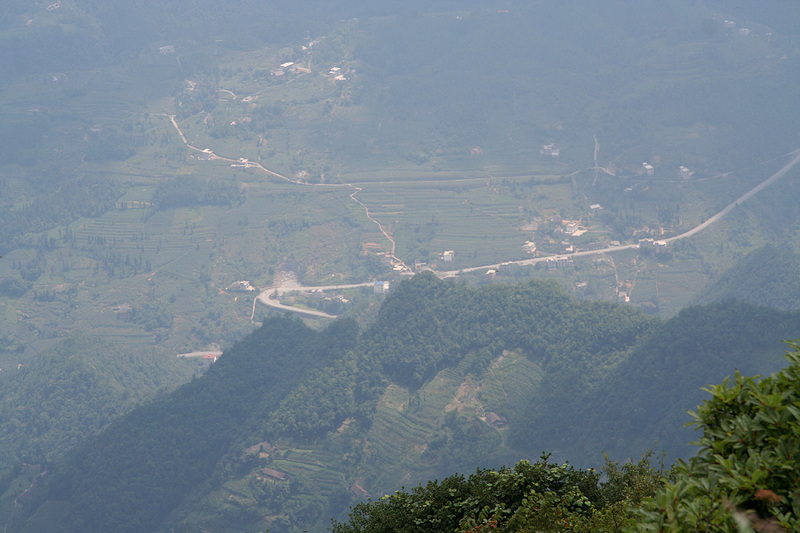 We drove back to the main road where my "second driver" said goodbye and headed north, while we continued back to the Zhangjiajie airport. We stopped for a (very late) lunch at a nice place overlooking a lake. 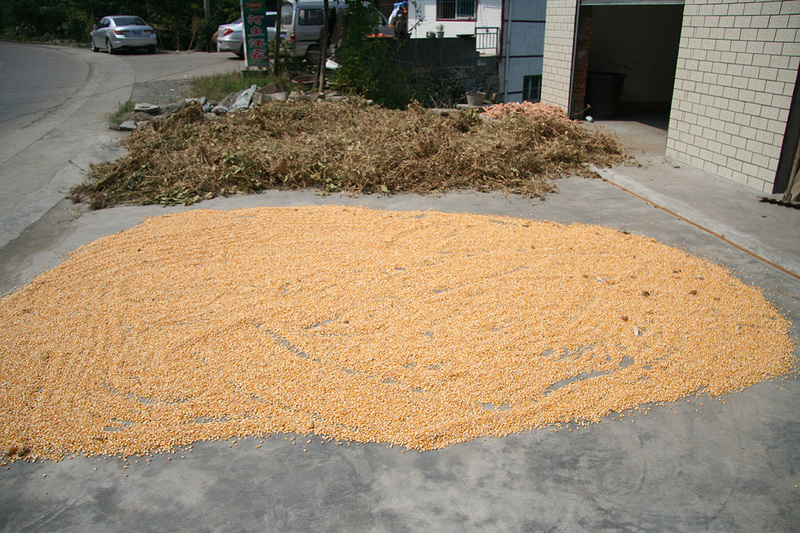 They were drying corn and chilis outside. 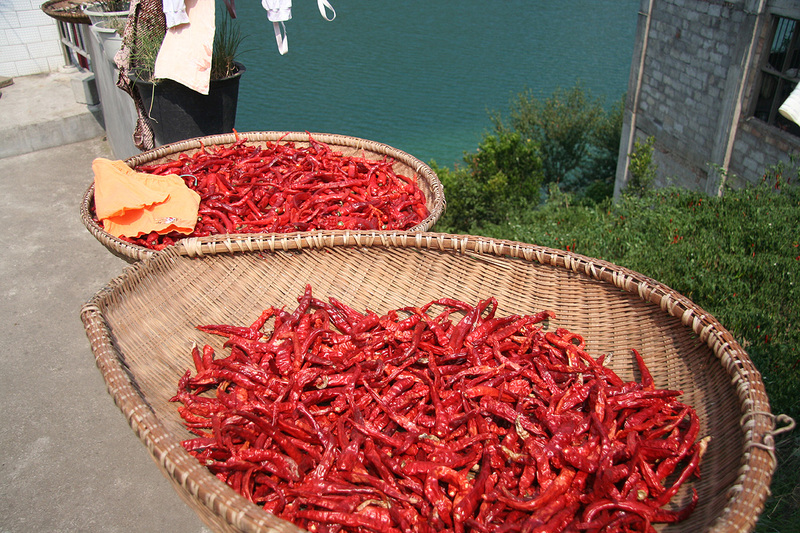 This area is known for hot and spicy food. 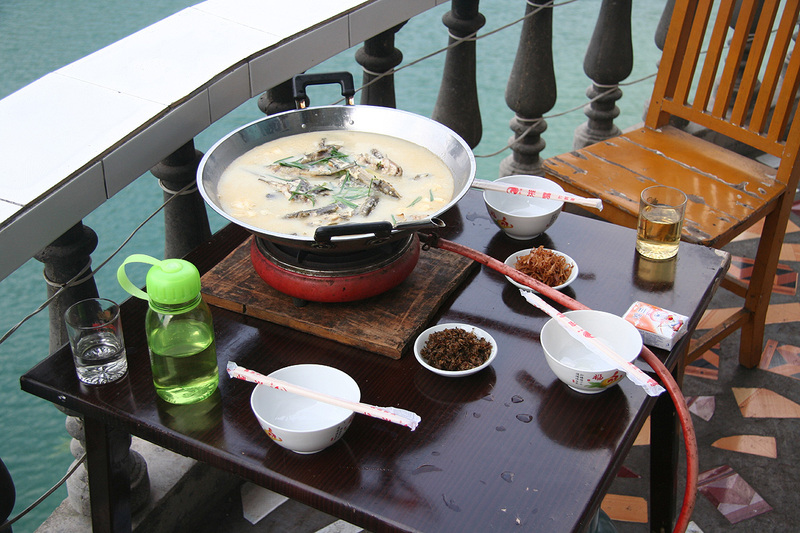 We were served a heated wok containing fish from the lake. Very tasty indeed. The temperature stayed around 35 Celcius, but the lake gave a nice cooling effect. Still, a cold, local beer tasted exceptionally well. 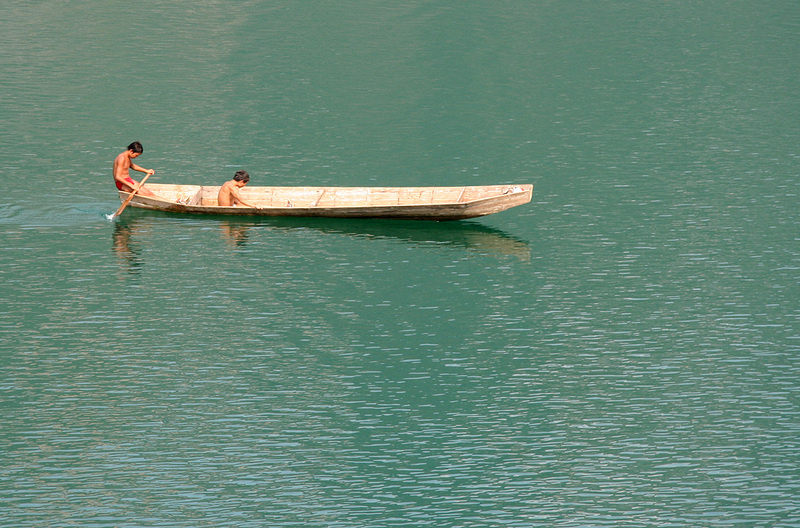 The locals were busy on the lake, some in traditional boats others looking after their nets holding fish. Our route of travel can be examined in more detail on the map below. My flight left around 2130, the poor connection required another short night in Shanghai, then a long flight via Frankfurt back to Bergen, arriving here at midnight August 24. I must admit that this was more exhausting than planned, my body kept telling me for the next couple of days that I needed REST, lots of REST. 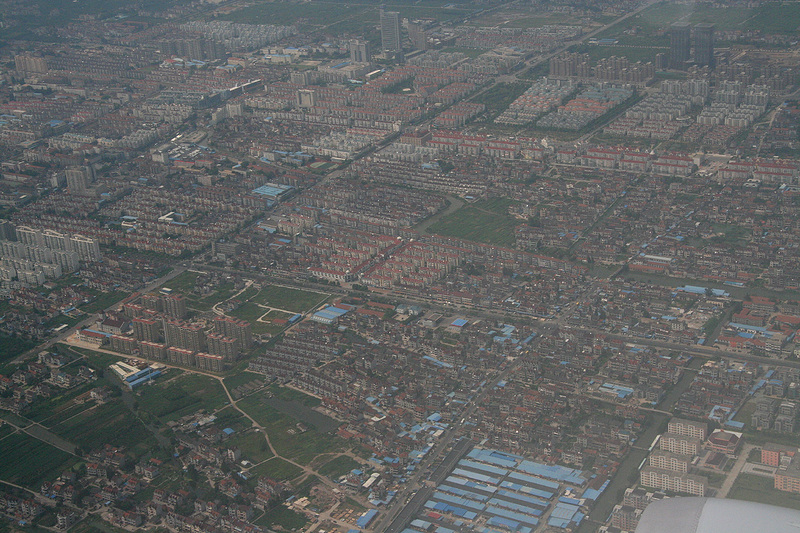 See this map for an overview of my travel in China on this trip. 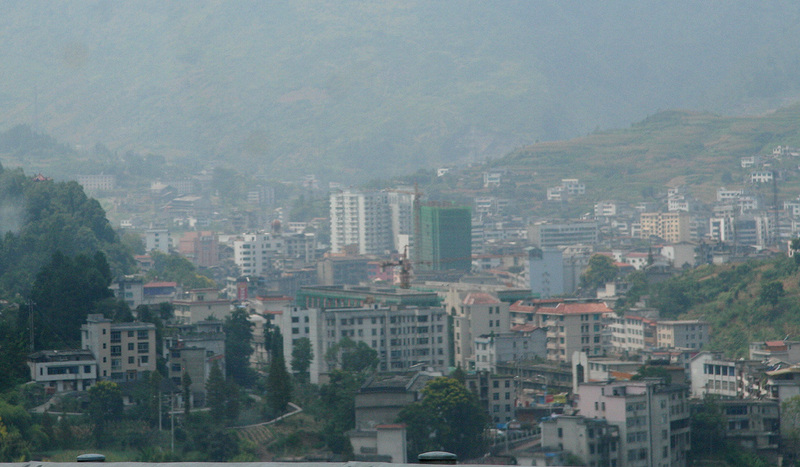 He Feng Jien, as seen from where the trail started. Wang Ming, at the edge of He Feng Jian. People transport, this truck was overloaded with people. 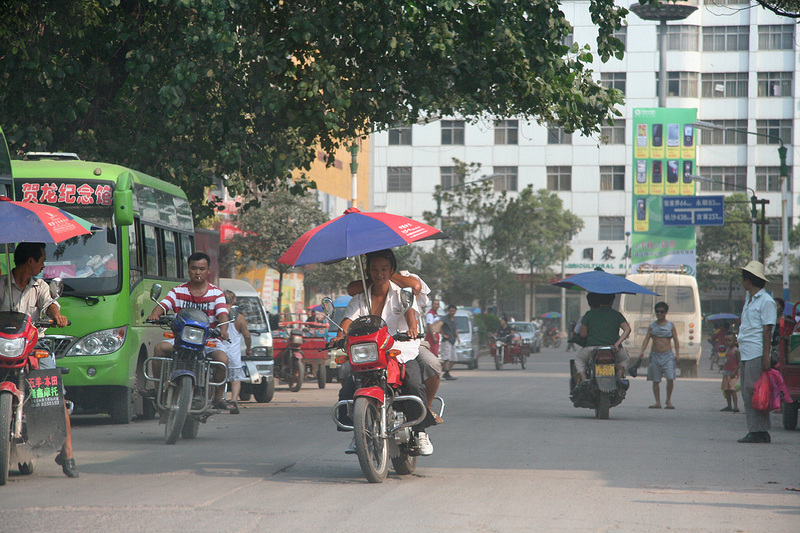 City life, motorcycles having a sunshield were popular.